As the world of veterinary medicine continues to evolve, so do natural treatment options for pets, including the use of all–natural supplements. If you have any doubts on the popularity of supplements consider this; the pet supplement market reached roughly $2.5 Billion in sales in 2017 and is expected to continue to grow in the coming years. There is a shift among pet parents to seek healthier and more natural treatment options for themselves and their pets, and many are seeking their veterinarian’s advice on the use and benefits of supplements. The veterinarian’s role is to advise pet parents on the health and wellness of their pets, and this needs to include a multi–faceted approach aimed towards both prevention and treatment. Prescription veterinary diets have traditionally been a staple in the prevention and management of a variety of medical conditions in pets including renal, hepatic, urinary, osteoarthritis and other conditions. They were first introduced by Hill’s in 1951, and thus without recognizing it, veterinarians have been using nutritional supplementation as an integral part of their therapeutic approach for almost seven decades. Fast forward to 2019, we now have a wide range of supplements that encompass both broad and specific health issues that can offer similar or added benefits when compared to prescription diets. 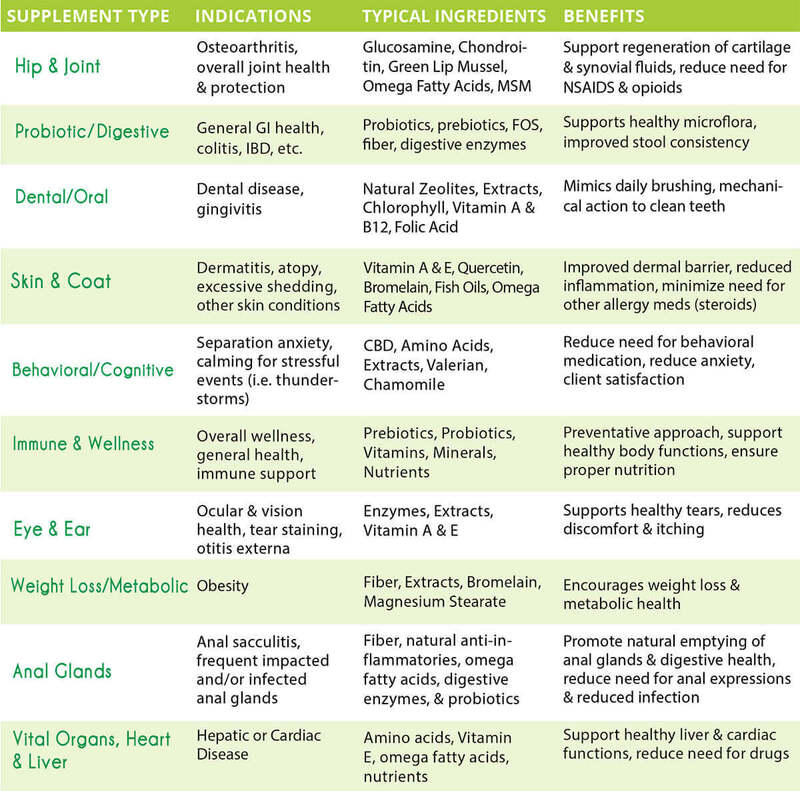 Included in the range of supplement options are those that are intended for overall digestive, immune and general health, as well as supplements for disease-specific conditions such as osteoarthritis, hepatic, behavioral issues, dental disease and everything else in between. With the plethora of supplements available in terms of conditions, ingredients, brands and quality, the veterinarian’s role in guiding their clients to the right choice is not only more difficult, but also more important than ever. There are three main approaches to practicing veterinary medicine. Traditional veterinary medicine is what most veterinarians subscribe to and actively practice. This form of medicine relies heavily on vaccines, drugs, medications, diagnostics and surgical intervention to treat individual disease(s) and body organs and systems. Holistic veterinary medicine uses natural, homeopathic and herbal medicines, as well as treatments such as acupuncture for a less invasive and more holistic approach. There are multiple clear advantages and disadvantages to both. At the crossroads of the two is Integrative veterinary medicine, which utilizes the best of both worlds for a more comprehensive approach. Integrating the use of natural supplements in conjunction with traditional drugs and medications allows the veterinary practitioner to get the advantages of Traditional medicine (i.e. more immediate and dramatic results) with the advantages of Holistic medicine (i.e. minimizing side effects & long–term management). Clients appreciate a comprehensive approach that incorporates both natural and preventive measures, along with traditional medications to ensure the health and well–being of their pets. Whereas veterinarians previously reserved supplements as OTC recommendations to be purchased outside of the veterinary practice, more practice owners are recognizing that dispensing supplements in-clinic represents practicing a higher quality of medicine while providing additional clinic revenue through added product sales. Many clients are already familiar with common types of human supplements that they use for themselves and typically will expect supplement recommendations to be offered as part of the treatment options for their pet. For those clients who are unfamiliar with supplements (either human or veterinary), the added guidance can add significant value to the veterinary visit and can increase overall client satisfaction. To understand how to recommend the right supplements for patients, it is important to understand common questions and concerns that clients have in regards to using supplements. For most clients, the wide variety of choices in supplements can be very confusing. It is therefore important for the veterinarian to become familiar with trusted brands/companies that deliver high quality ingredients with reliable sourcing. Unfortunately, with the advent of market places such as Amazon, the barrier to entry for any would–be–opportunist looking to sell their own brand of pet supplement is lower than ever. Veterinarians should therefore consider becoming familiar with trusted supplement companies through veterinary trade–shows at CE events, through veterinary distributors, veterinary journals and peer reviewed studies before recommending them to others. Clients will typically have questions involving overall safety, side effects, palatability and dosing of supplements. Additional questions will be around length of use, and if combining supplements together or with other medications poses a problem. Because these questions vary for each individual supplement, it is important for the veterinarian to become familiarized with the supplements the same way they would prior to prescribing prescription drugs and medications. The diagram below illustrates some of the different supplement option categories that veterinarians can recommend for common conditions in pets. In the practice of veterinary medicine, it is important to “practice” recommending both traditional medications along with supplements as part of a comprehensive therapeutic approach.